The Enchanted Isle; or, Raising the Wind on the Most Approved Principles by William and Robert Brough. A burlesque based on Shakespeare's The Tempest. Miranda was played by Marian A. Taylor. The ADELPHI is, we expect, just at present doing better than any other theatre in London--Mr. O. Smith's Prospero, in the new burlesque, being pronounced a very fine performance, if not altogether an 'interpretation' (as the new critical word goes) of Shakspeare's [sic] character. And when the audience have, in addition, to laugh for a full hour at Mr. Wright in "Slasher and Crasher," it is wonderful how they eventually survive. 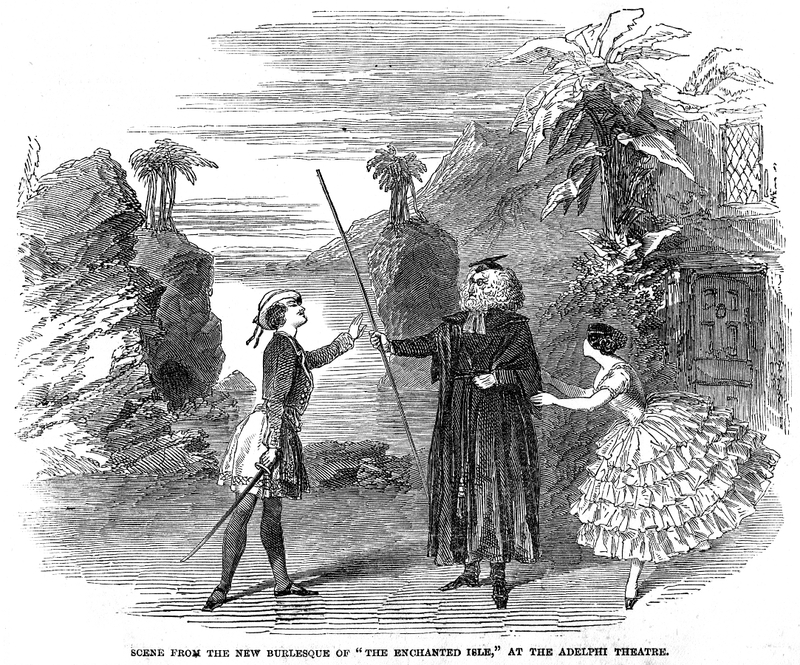 We have engraved one of the most striking scenes in the new burlesque in which Prospero (Smith) and Ferdinand (Miss Woolgar) are in the ascendant; and the lofty magician has just exercised the potency of his wand.